I suppose I should be watching the Oscars now–but first there was dinner, cleaning up and then this little routine. For what it’s worth, I’ve watched a surprisingly high number of this year’s nominees given my father-of-a-toddler status. But aside from The Imitation Game, paying for a ticket at a movie theater wasn’t involved: I saw The Grand Budapest Hotel on a plane (appropriately enough, given all the travel in that flick), watched Unbroken at a Comcast-hosted Newseum screening, saw CitizenFour as part of a security conference, and caught Guardians of the Galaxy and The Lego Movie on DVD. Maybe I’ll catch up on a few more Oscar-nominated movies during all the air travel I have coming up: Saturday, I depart for Mobile World Congress in Barcelona, and then after a week at home I’m off to SXSW in Austin. 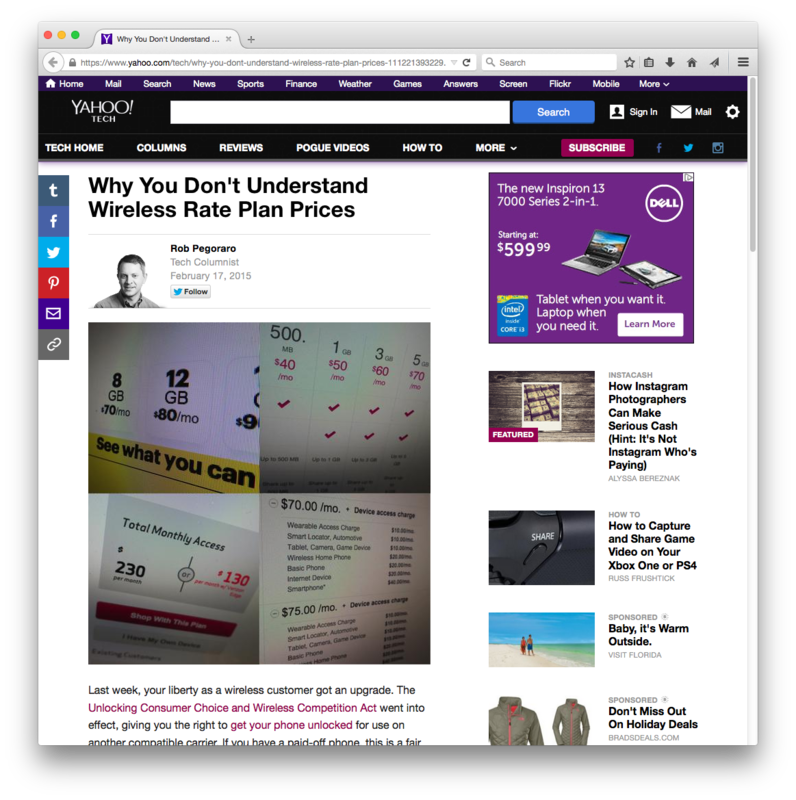 This get-off-my-screen rant about confusing, contrived pricing schemes for wireless service–basically, I had to vent after the last few updates to the Wirecutter’s guide to wireless carriers–has already yielded some simplification. T-Mobile realized they hadn’t removed a description of an old rate plan from a chart (it’s been replaced with a prepaid plan that’s not nearly as attractive) and updated that. We, in turn, need to add a note about that to our story. It took me writing this cheat sheet to finally go in and edit my own Google Calendar notification settings so I wouldn’t get pinged via e-mail, in-app and in-browser notifications for an event invitation I hadn’t even responded to, much less accepted. This entry was posted in Weekly output and tagged ATT, Events from Gmail, GCal, Google Calendar, Oscars, sprint, T-Mobile, Verizon Wireless by robpegoraro. Bookmark the permalink.